Complaint: I took my car to Power Toyota of Buena Park in Buena Park, California to fix a small problem. The technician and service manager who were working on my vehicle demonstrated to me what was a total lack of diagnostic ability. I sincerely wish that all mechanics will soon become idiots like the ones who were working on my car at Toyota of Buena Park. 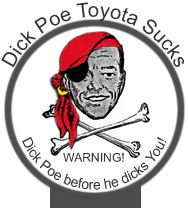 Please,forgive my rude language, but this time I was really disappointed with the dealership staff (7 years ago when other people worked there, that place was really great).